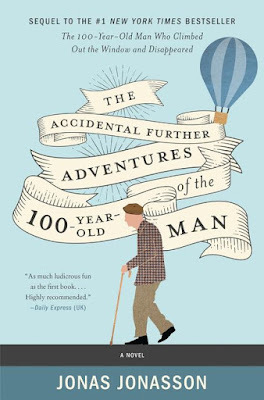 Brooklyn Digest: Books: "The Accidental Further Adventures Of The 100-Year-Old Man"
Books: "The Accidental Further Adventures Of The 100-Year-Old Man"
Jonas Jonasson, the acclaimed international bestselling author, always claimed that Allan Karlsson, the beloved centenarian and main character of The 100-Year-Old Man Who Climbed Out The Window and Disappeared, would not return for a sequel. Jonasson tucked his story away on a shelf, but recently had a change of heart, saying, "I felt the need to take a closer look at the world again. My literary career started by pulling down the pants of the twentieth century. It did not help much, so I thought I would give it another go! The new century deserves more of the same. However, Allan Karlsson was never meant to make a comeback. He just happened to, as he does. He was the stand-in for the main character I first had in mind (who got the boot as we never really got to know each other). Because, let's face it, no one is better suited to reveal the shortcomings of mankind than Allan. He is a natural." This reluctant centenarian has more adventures in store, and the result is the very entertaining, witty, hilarious, entertaining novel, The Accidental Further Adventures Of The 100-Year-Old Man, about Allan and his irresistible sidekick, Julius. "A life of luxury on an island in paradise ought to be satisfactory to just about anyone," writes Jonasson. "But Allan Karlsson had never been just anyone, and his hundred-and-first year of life wasn't the time to start. "It was, for a certain amount of time, gratifying to sit in a lounger under an umbrella and be served drinks of various colors at whim. Especially when one's best and only friend, the inveterate petty thief Julius Jonsson, was right next to one. "But soon old Julius and the much older Allan grew tired of doing nothing but frittering away the millions from the suitcase they'd happened to bring with them from Sweden. "Not that there was anything wrong with frittering. It just got so monotonous. Julius tried renting a fully staffed 150-foot yacht so he and Allan could sit on the foredeck with fishing rods in hand. It would have been a pleasant break if only they enjoyed fishing. Or, for that matter, eating fish. Instead, their yacht excursions involved doing the same thing on deck as they'd already learned to do on the shore. Namely, nothing at all. "Allan, for his part, made sure to fly Harry Belafonte in from the United States to sing three songs on Julius's birthday - speaking of too much money and not enough to do. Harry stayed for dinner even though he wasn't paid extra for it. Altogether, this constituted an entire evening of pattern-breaking. "By way of explanation for his selection of Belafonte over anyone else. Allan pointed out that Julius had a soft spot for this newer, youthful sort of music. Julius appreciated the gesture and didn't mention that the artist in question hadn't been young since the end of the Second World War. Compared to Allan, he was, of course, a child. "Although the superstar's visit to Bali provided no more than a speck of color in their otherwise dull gray existence, it would prove to affect Allan and Julius for a long time to come. Not because of what Belafonte sang, or anything like that, but because of what he brought along and devoted his attention to during breakfast prior to his journey home. It was a tool of some sort. A flat black object with a half-eaten apple on one side, and on the other a screen that lit up when you touched it. Harry touched and touched. And grunted now and again. Then tittered. Only to grunt once more. Allan had never been the nosy sort, but there were limits. "Harry Belafonte realized that Allan had never seen a tablet before and was delighted to demonstrate. The tablet could show what was going on in the world, and what had already gone on, and it verged on showing what was about to happen. Depending on where you touched, up came pictures and videos of all imaginable sorts. And some unimaginable ones. If you touched other buttons, out came music. Still others, and the tablet began to speak. Apparently it was a 'she,' Siri." Allan and Julius decide to take a hot air balloon and have prepared themselves for some spectacular views, but they don't expect their accidental solo trip to end with an emergency sea-landing. They didn't expect to be rescued by a North Korean ship and who would figure that the captain of that ship was harboring a suitcase full of contraband uranium, on a nuclear weapons mission for Kim Jong-un? They are thrown into the center of a diplomatic crisis involving world figures like President Donald Trump and German Chancellor Angela Merkel, and thinks become very complicated for him. 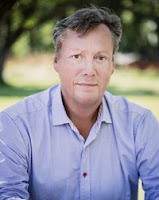 Jonasson writes of what happens to Allan and Julius when they arrive in North Korea, "It was clear that Allan had some sort of plan, after all. And, what was more, Julius had partly gathered what it would involve. But only partly. "In the breakfast room the next day, Allan found a lidded plastic box full of teaspoons under one of the serving tables. He dumped its contents onto the table with the aim of keeping the box, at which point a waitress who had heard the clatter hurried over and asked what he was doing. "Allan instructed Julius to bribe the waitress with the gold lighter he'd stolen from the Indonesian hotel manager. "The young woman stopped looking at her reflection in her new possession and dashed off. "'We're on the same page,' said Allan. "The mixture was necessary to lure the driver out of his car. Neither Allan nor Julius had the muscles to lift him out, and two things were certain: first, the driver would never leave his car voluntarily; second, he was not going to drive them to the airport, no matter how hard they tried. "Minister for Foreign Affairs Wallstrom joined them. She had a cup of coffee and a French-Korean croissant while standing at the gentlemen's table, saying she was in a rush. The diplomatic passports had arrived as they should. The minister handed them over, wrapped in a napkin. "'Much obliged, Madame Minister,' said Allan. 'When might the departure take place? We have a few things to take care of today. It wouldn't be a bad idea to know. "Minister for Foreign Affairs Wallstrom was just getting to that. Kim Jong-un had conveyed the message that their next meeting would not only be their last but would be followed in her departure from the country that very afternoon. "'What is it the American president wants explained?' Allan asked. "The minister looked sad. Julius felt sorry for her. But mostly he felt sorry for himself. "'As I said, fifteen thirty,' said the minister. 'I hope you will be there.' She wasn't sure she would ever see Messrs. Johnson and Karlsson again. "'My name is not Julie,' said Julius." The interplay between Allan and Julius amidst all this international intrigue is very funny and adds a touch of whimsy as they are shuttled around the world. This is a triumph from Jonasson to bring these joyful characters into the present moment.